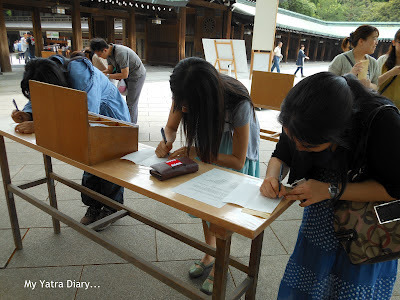 The third day of our exploration in Tokyo started with a place of worship again, only this time it was not a temple but a shrine - The Meiji Jingu Shrine - based on the Shinto religion, the ancient original religion of Japan. Dedicated to Emperor Meiji and his consort Empress Shoken, the temple was built in 1920 as a dwelling place for their divine souls. Together, they laid the foundation for a modern Japan by endorsing sincere virtues of peace, amity and friendship which we can evidently see in the everyday lives of Japanese people today. The moment I had a first glance of the place, I instantly knew why it figured high on the must visit list of places for any traveler to this part of the world. An imposing Torii gate stood at the entrance, as the shogun (military officer) overlooking giant dense trees. From here the shrine was a 15 minute walk away. As I walked under it, I could feel myself step slowly from the day’s light into the shade of the trees. 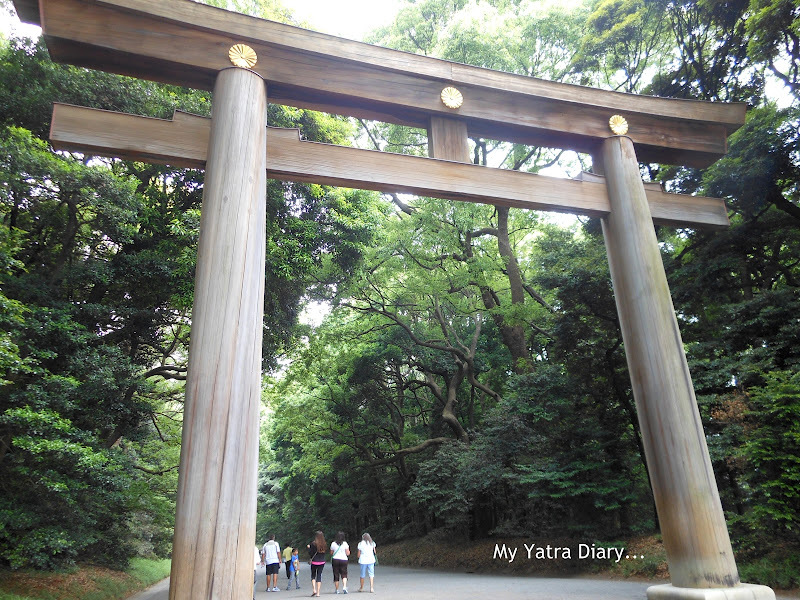 The Torii gate opened my view to a blissful world away from the hectic humdrum of the world outside. Planted sincerely by hand some 90 yrs ago in admiration of the enshrined deities, the large cluster of trees today have grown into a dense forest and bent in such a way as if to give you a warm welcome in the house of the Emperor. 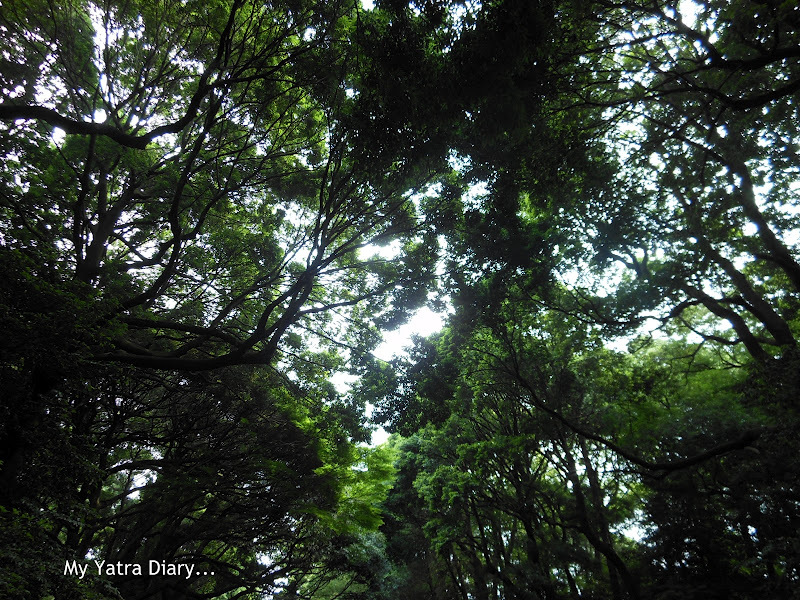 It was a very pleasing experience walking under them and I could feel the pure energy floating in the air. Further into the walk, there was a souvenir shop brimming with all kinds of Japanese knick knacks – Fans, chopsticks, wind chimes, etc. Having been at the Nakamise Dori Arcade, there was nothing new that we saw here. Except a tea tasting kiosk, where we had our very first green tea tasting experience thanks to the warm insistence by the lady seller. The tea tasted quite bitter much in contrast to her cheerful smile which was very lovely and sweet. Besides this, there was a food court but the chairs were vacant and people seemed more interested in the stuffs on sale rather than filling their platter. A few steps ahead, 60 wine barrels lay neatly arranged in an organized fashion. Adjacent to it was a board highlighting the significance of the barrels. 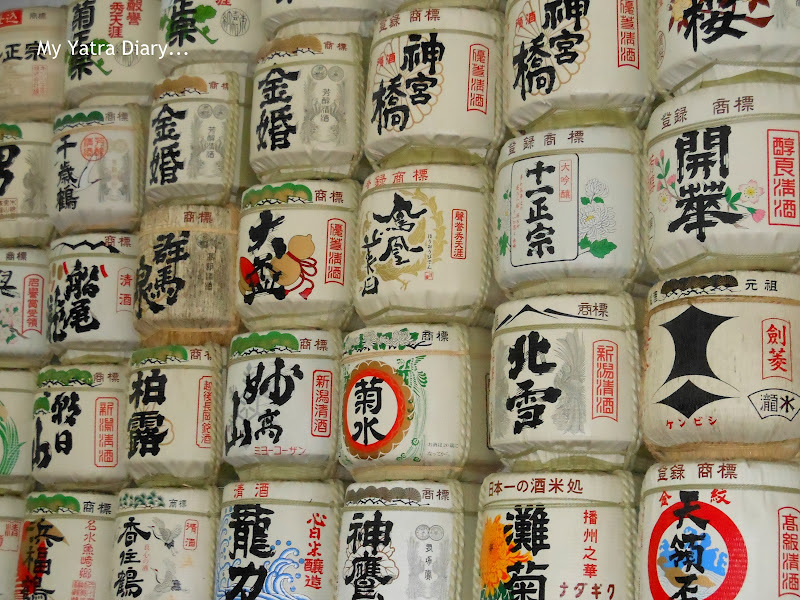 The Meiji emperor believed in taking the good from other lands and rejecting the bad. In an endeavor to promote modernization while also keeping Japan’s age old spirit and traditions, he adopted many of the western features and set an example by taking western food and in particular enjoying wine with it. Thus, in his honor, the French contributed these barrels of wine which today stand as an earnest prayer in peace and amity amongst the two countries. 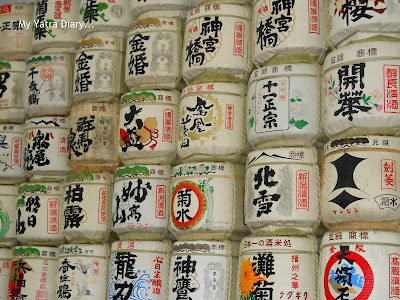 Diagonally opposite was an additional arrangement of a similar fashion; that of barrels of sake offered by the eminent brewers of Japan to the enshrined deities once every year to pray for the prosperity of the brewing industry of Japan. A second Torii gate indicated that the shrine was now near. 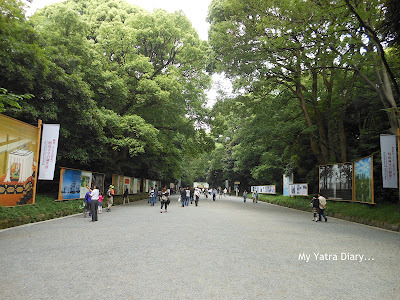 The sideways were lined with paintings and pictures illustrating Emperor Meiji's life. Through them, it was fascinating to get a glimpse of the entire history of the Emperor spanning right from his birth to his concluding enshrinement here. 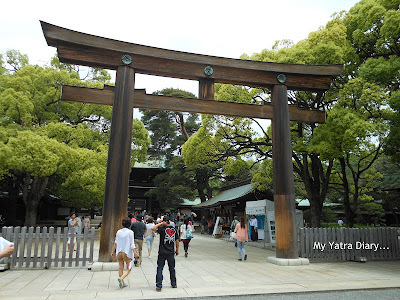 A short walk through history and the third and final Torii gate was now in view. Beyond this gate stood the main temple, a different kind of a prayer offering space and a sacred rope. 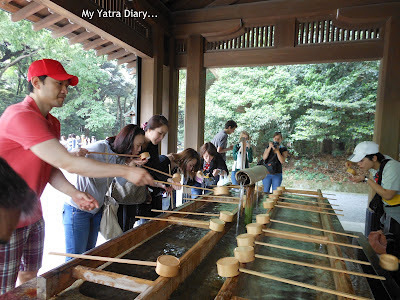 There was also a washing area where I cleansed my hands and rinsed my mouth just the way I had done in the Sensoji temple. 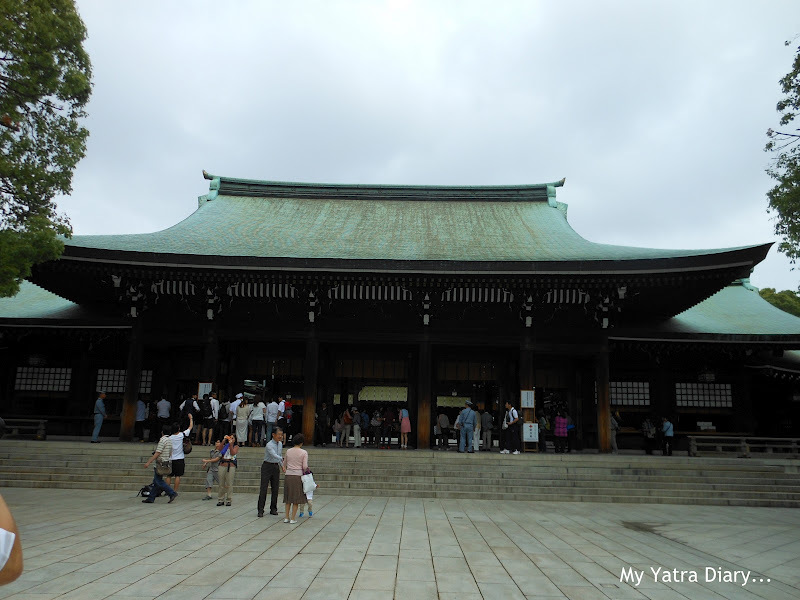 The main temple was plain and simple and painted green in color. As it was a Sunday, there was a bit of rush and I saw many people busy clicking photographs. Inside, however, the main temple hall was quite peaceful. Photo taking was prohibited. Only tranquil moments of peace and prayers prevailed. 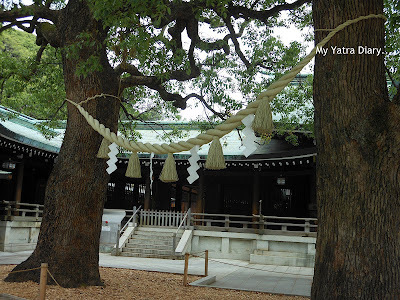 Outside, in the temple complex, in one corner dangled a sacred rope bound to two huge trees. In another, a large table lay stretched besides a wooden board and a huge tree. A wooden box, some blank papers and a few pens lay scattered on it. The box specified to write down your prayers and place them in an envelope along with your offerings. Many did likewise. Some others preferred etching them in chunks of wood and hanging it on the wooden board instead. 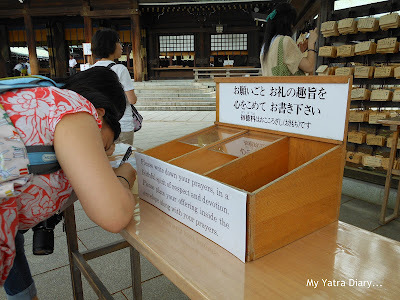 Most of these prayers were in the local Japanese language but I did see some that read in English – I hope to continue to be happy in future and find ways to lead a meaningful life ahead – Simple prayers and simpler wishes were all that had been asked for. As I drove back out of the shrine, I happened to read a waka poetry written down by the Emperor in the shrine information pamphlet that was handed to me a few moments ago at the entrance. People must be taught that we can face any situation if we have makoto, or true sincerity, in our hearts. This is the foundation of education. - Waka Poetry by Emperor Meiji. ... And I found my mind filled with thoughts of the Emperor, his consort and the temple’s concealed messages of gentility and naturalness in deeds. It all blended together beautifully - the poetry, the message, the environs, the feel... and I came to appreciate the simplicity of the shrine even more. A few months later, that is today or even years down the line, with all due respect to the shrine, I may or may not remember the exact make of the shrine or its interiors, but I will surely remember that walk... an oasis of peace, calm and tranquility... and that is the reason I will be there again if I ever get to Japan, someday. Nearest Metro Station: 1 min walk each from the Harajuku station on the JR Yamanote Line and from the Meijijingumae Subway station on the Tokyo Metro Chiyoda Line Exit 1/2. You saw a lot while you were in Japan. We were in Tokyo for only 3 nights, but we saw quite a bit, too. It was fun! 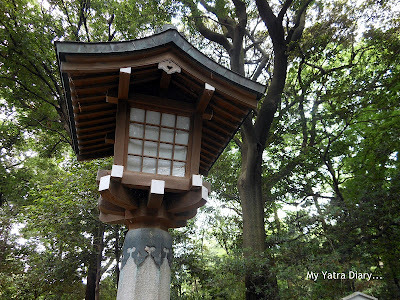 A peaceful and interesting way to learn history of Japan Arti...Thank you for sharing such beautiful photos and interesting facts. Serene place. You seem to have had a nice time there. Lovely write up. Arti you are the most perfect of tour guides. I love that Torri gate, and the cluster of trees. and those barrels of sake!!! thanks for sharing the waka poetry, it's beautiful. happy weekend to you Arti. I must be feeling very good walking under the green canopy too. The Torri Gate is huge. You don't see the massiveness until people are standing nearby. This looks like a very interesting place with lots of activities. Beautiful Pictures and Nice Pictures. Keep it up once again and Thanks. Just happened to see your blog. Posts has excellent pictures with appropriate information, to say the least. I am a blogger too! But, I write in Tamil about the significant places of our India with photographs. If you find time, visit and comment. Keep writing! Thanks a lot for sharing this precious information about Shintoo religion. I was eagerly waiting for the article about this subject from this blog. I can't find words for the excellent photography. Hi, Arti! 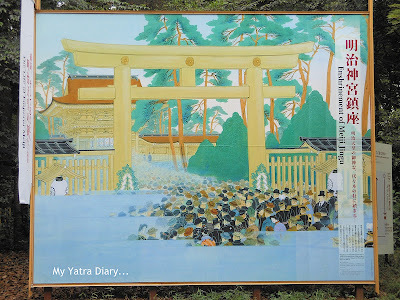 Your photos of torii gate is fabulous, especially the first one! It shows the torii’s imposing beauty consisting of two horizontal beams and two upright pillars. 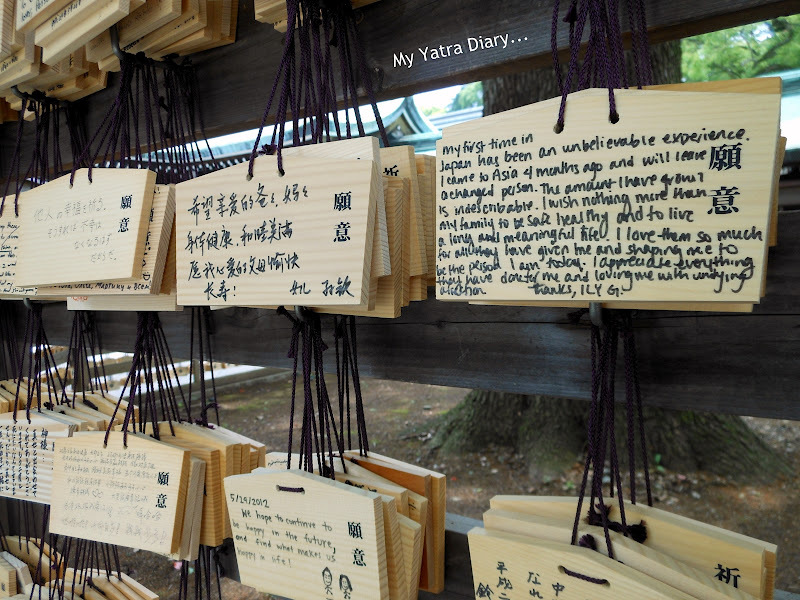 Shrines are very familiar place, so I read with interests how it felt to the tourist from India. 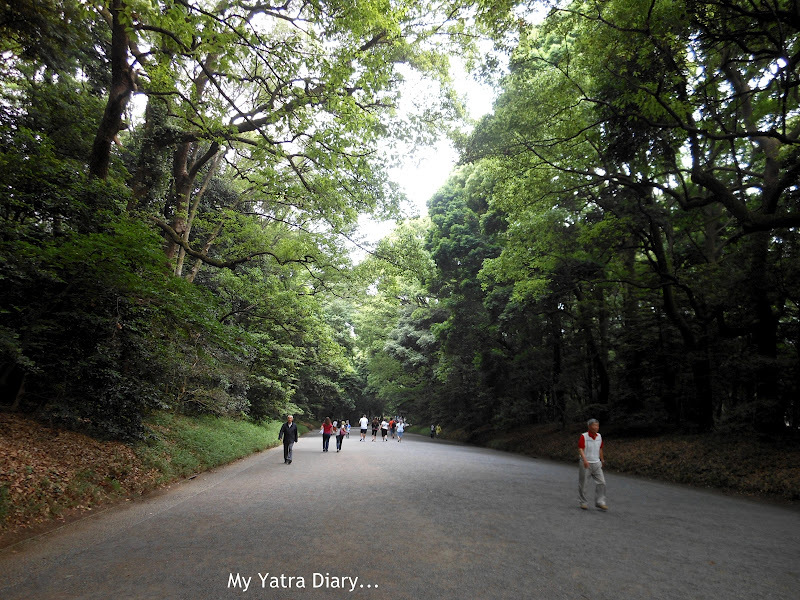 I always feel surrounded by the spirits of nature whenever I visit a shrine. 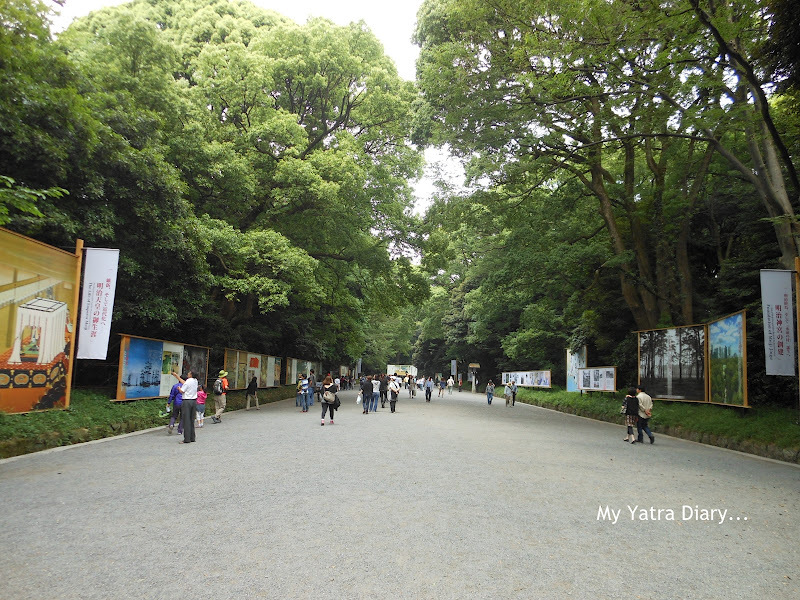 I’ve never been to Meiji Shrine, so thanks for the information. Have happy days ahead. 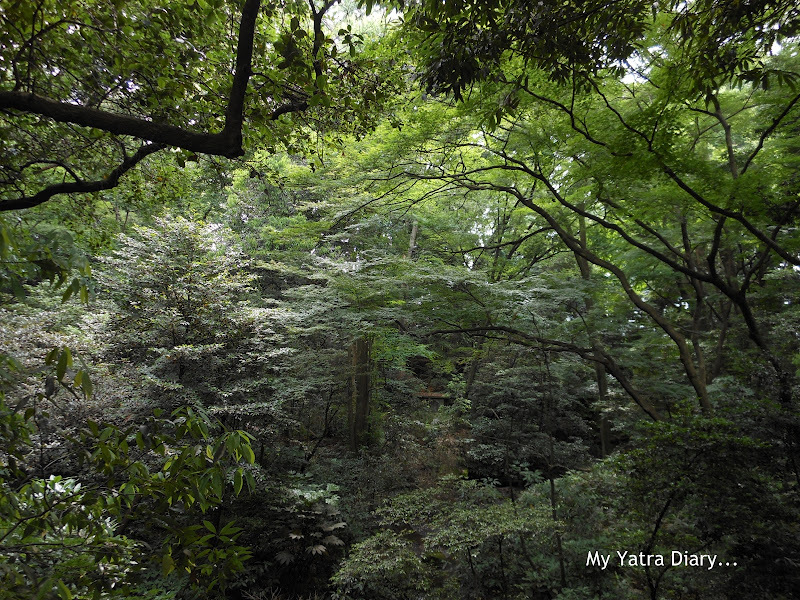 I also feel pure energy floating in the air when I walk under the dense trees at the approach to a shrine. There may be something except for the negative ion. I'm glad you seem to enjoy Tokyo. How very lovely! I do long to visit Japan. To know Tokyo or Japan through your eyes interests me and makes me feel everything so fresh!! I have not been to Meiji Shrine yet. This is the must! Emperor Meiji is one of the most loved emperors in Japan. Most of trees were donated by people all over Japan. It is delightful to see those trees have grown big enough to make beautiful canopies. Impressive pictures and equally lovely write up. Good one, Arti! This was a lovely account of the beautiful places in Japan and equally enticing pictures, Arti! से प्रस्तुत किया है.हर पोस्ट एक से बढ़कर एक. गयी है.देर सबेर जरूर पढूंगा. इस बार मैंने हनुमान लीला पर एक और पोस्ट लिखी है. परन्तु आपके बिना अधूरी है,आरती.... जी. Beautiful shots. I do like those prayers etched on the wood. @Arti Another amazing post for your Japan Yatra.Thanks for the photos, Beautiful.Thank you so much for the post. 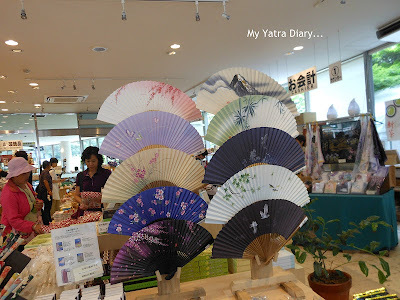 Another wonderful post, I've so enjoyed your thoughts on Japan. You are a wonderful tour guide, Arti. You always see sincerely and tell honestly a story of place and of your feelings about it. I always enjoy walking with you. That's a nice photos and sentence. 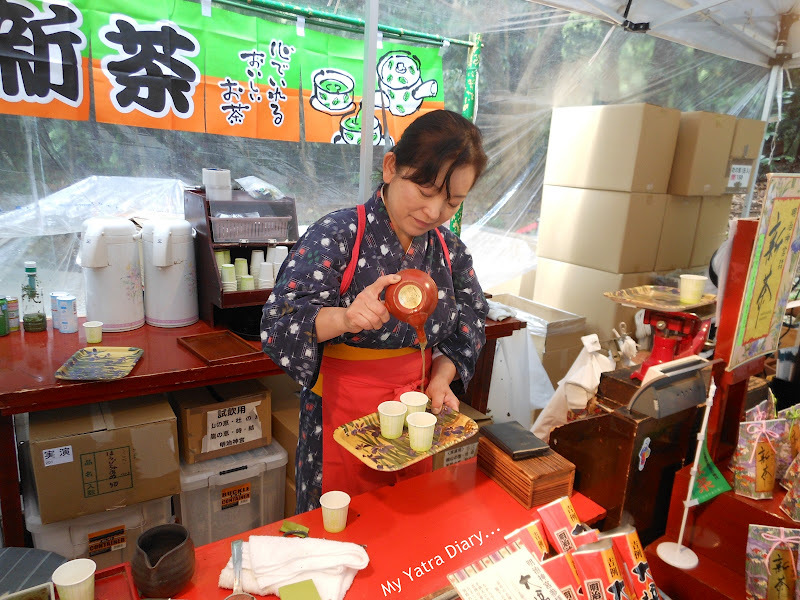 During the New Year in Japan, there are tons of people in Meiji Shirine. Beautiful info about this beautiful shrine. 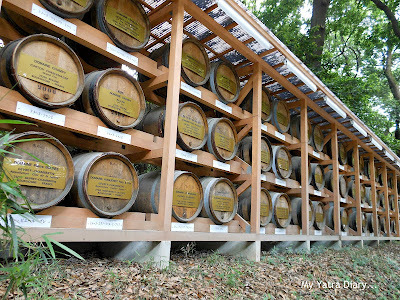 Probably I have seen (not physically) those barrels lined up in honor of the Emperor. Nice account and photos! How lucky the emperor is to have barrels of wine stored for him.. that pic stole the show! I love the green serene around there, do you leave your prayer words there arti...? nice acount....and I am amazed by the first Torii gate! !..it is towring and majestic!!! Everyhting about Japan is fascinating. Just dropping by to say hello and wish you a good weekend. As Barb says, you are a wonderful tour guide. Meiji shrine is surrounded by special spirits, where I often walked when I was young but my memories have gradually faded away. However,today your post brought me to our special memory; elder son's birth celebration!! !My family went to the shrine with our first child,son, as a celebration of his birth.We prayed for his future and happiness at the Shrine. i believe the Chinese or the Japanese were the first to introduce tea to the world .. so you must have experienced a wide variety of tea there if you are a tea lover ..! Very interesting to see their places of worship.. Beautifully captured! You certainly brought that shrine to life.I enjoyed the read and learning about the history. I have yet to visit Japan but the more I read of late the more I'd like to go. Wonderful write-up, Arti! We loved the Meiji shrine and you're right it is an unforgettable place because it offered so much. We went during a Sunday and there were quite a few weddings going on. Seeing the traditional costumes made it even more special. I got that sense of calm right away! Such wonderful sights from Japan! Great going through them. How peaceful it looks. Loved the greens.. though, like you, i'm not so much for 'green' tea :-). Those souvenier shops looked so interesting. What did you ask for at the temple? Such a lush green place. Beautiful! And their architecture is very attractive too. A lot of learning happens when we visit of a Japanese attractions, right? I learnt a lot when I visited the Japanese Tea Garden in San Francisco. The location of the shrine is very beautiful. Arti, Interesting to know about the new places it history and beautiful pictures. What a lovely place this is. Thanks for sharing the amazing pictures and giving us the detailed description of this place. Now I'm tempted to visit this place as soon as possible. You take us to the place by your description.